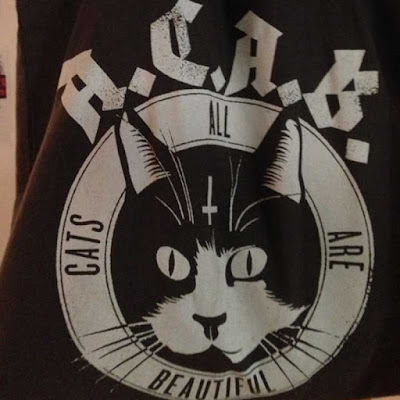 A woman has been fined by police for walking through Madrid in Spain while carrying a bag that declared "All Cats Are Beautiful". As Spanish graphic designer Belén Lobeto walked home on Sunday night she was pulled to one side by policemen and given an on the spot fine for the fashion article. Despite the fact that the bag carried an image of a cat and the phrase "All Cats Are Beautiful" beneath the letters ACAB, the police insisted it was an acronym for the phrase "All Cops Are Bastards". She was therefore fined under the controversial Citizens Security Law, or Gag Law as it has been dubbed by its critics, for disrespecting the police. The €100 fine was issued in a street near the Calderón stadium where there was a heavy police presence due to the Copa del Rey final between Barcelona and Sevilla. "I was going quietly to my house when suddenly two officers ran up to me and asked for my ID and said they would issue a fine because I was carrying this bag," Lobeto explained. 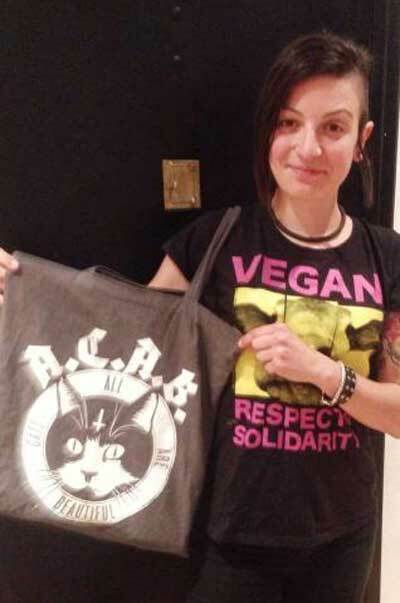 "I asked why and expressed doubt that my bag was attracting any attention much less causing a crime and told them they should take me in front of a judge to explain," she continued. Ms Lobeto said she tried to make the police see reason but "changing their mind was impossible and if I didn’t shut my mouth I would have been taken away". Great, that means they could make any acronym sound demeaning and fine people for it. The irony. 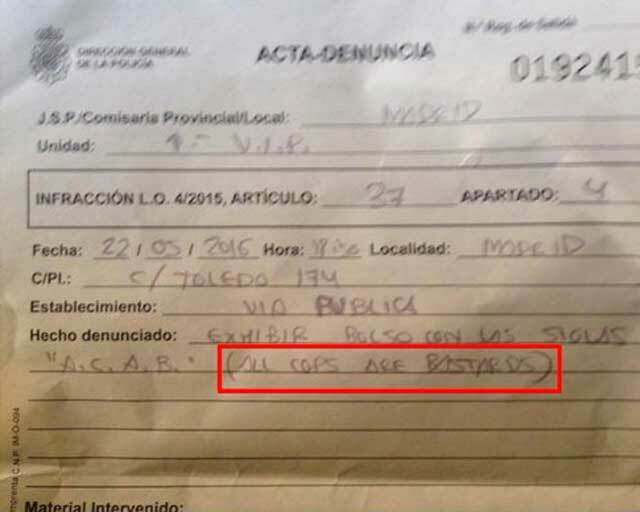 So ... in Madrid, anyway, All Cops Are Bastards? "Todos los policías son bastardos"? I hope she contests it and the judge sentences the cops to community service. What a couple of wads. Or, as they would prefer, ACOW. Seems like they proved the point of the acronym they were objecting to! They would have gotten further by having a sense of humor. The bag was obviously poking fun at the whole thing.